Congratulations to the winners of Change the Course – The NYC Waterfront Construction Competition, which is designed to provide innovative and cost-saving solutions for completing marine construction projects and maintaining waterfront infrastructure in New York City. Three winners, D-Shape, Andrew Rella and John Sheridan of The Sheridan Corporation, will be awarded a total of $90,000 for their selected ideas. The concepts will be presented to New York City agency representatives and maritime construction professionals and potentially be incorporated into future NYCEDC waterfront projects. The awards are a result of a two-phase competition launched by NYCEDC in the fall of 2012, which led to submissions from leading experts across the globe seeking to transform New York City’s waterfront and ensure its sustainability in the 21st century and beyond. The winners were officially announced at the Change the Course Symposium, held April 10, 2013 at the National Museum of the American Indian in Lower Manhattan. 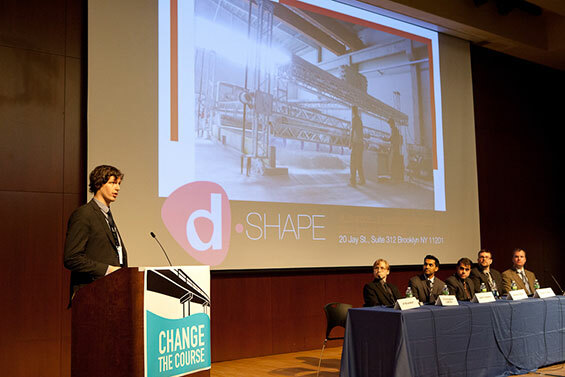 D-Shape ($50,000 First Place Winner) – D-Shape’s ‘Digital Concrete’ resolves a number of issues regarding the restoration of piers, piles and seawalls that populate New York’s waterfront. By 3D scanning, then 3D printing concrete, one combines the best of precast and cast-in-place methods. The advantages of quality control in fabricating off-site yet being able to closely fit the encasements, blocks or extensions to the surface that they are nestled into has a number of advantages, including lower costs, better quality control (thus longer life), lower labor mobilization and quicker delivery and installations. Furthermore, there is a potential opportunity to rejuvenate the waterfront by letting artists leverage the total freedom of design to add an aesthetic touch without a significant added cost. Dshape estimates the potential cost savings to NYC by utilizing its technology across all 565 miles of shoreline to be $2.9 billion. Andrew Rella ($25,000 Second Place Winner) – Oysters are normally cultured near the surface because this is where the highest flow rates are, and therefore where there is the highest transfer rate of the phytoplankton and algae that the oysters feed on. By down-welling highly oxygenated and nutrient enriched surface water through the means of a wave pump to oysters being grown at deeper depths, the quality of the water surrounding the oysters will be improved and will result in improved growth and decreased mortality rates. Increasing the oyster population in a body of water could have dramatic positive effects, creating nesting grounds and improving the water quality. Since it has been proven that oysters are capable of increasing the structural strength of the concrete which they grow upon, developing methods that encourage growth at greater depths will allow for more surface area to be covered, strengthening and protecting a higher percentage of the structure. John Sheridan of The Sheridan Corporation ($15,000 Third Place Winner) – By using more durable construction materials such as stainless steel and special mixes of concrete at a cost premium of 20%, it is entirely possible to realize an increase in the expected service life span of a waterfront structure from the current 50 years to a goal of 120 years, or more than 100%. For more economical and sustainable marine waterfront structures, value is not equivalent to cost, rather value is a function of both cost and duration of service life.